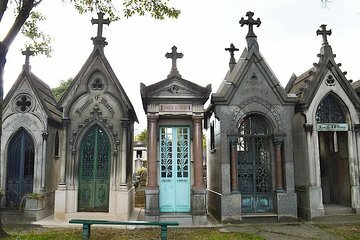 Erkunden Sie die Geschichte der berühmtesten Gräber in der französischen Hauptstadt bei dieser zweistündigen Tour durch den Friedhof Père Lachaise in Paris. Lernen Sie alle Prominenten kennen, die auf dem riesigen Friedhof begraben sind. A private tour... And not a lot more than a group! This was most informative, interesting back stories and a window into life and death in Paris ages ago! The guide paced the tour to our interests, filled in with lots of little facts and was a highlight of our visit to the City of Lights! 1 I'm travelling Europe on my own, I believe that for what this walking tour is, surely there should be a concession for single travellers, as I had to pay the full wack for 2 people 172AUD this is wrong! 2 The meeting place was so hard to find, please keep in mind that some of us travelling are in a foreign country and environment, walking, bus, train etc...In this instance McDonalds Which everyone knows would have been a much easier place to meet !! Having an experienced local guide saves you the time to search the cemetery. Peaceful and relaxing walk, while getting stories about famous people resting there. An enjoyable and informative walk with Claudia. A cemetery may not seem an obvious tourist destination but definitely worthwhile. Claudia brought to life many of the characters buried in this scenic and quiet part of Paris. Our guide was wonderful. However, we started the tour at the exit of the cemetery so we never got any literature or map. Also, for some reason we didn't see many of the burial sites I was eager to visit. I told her the kind of thing I was interested in seeing, but not having a map I couldn't tell her to show us the specific graves such as Isadora Duncan to name only one. very nice and informative tour. our tour guide Claudia was great.